Word has been received of yet another clash between Federal and Rebel forces along the line of the Paynted River. Catching the Rebels by surprise, the First Division of the Army of the Kennetcook made an over night march and threw a pontoon bridge across the river. As the 2nd Brigade crossed over, Rebel cavalry could be seen topping the low ridge ahead. As they hastened to deploy, a puff of smoke and loud report announced the presence of horse artillery. 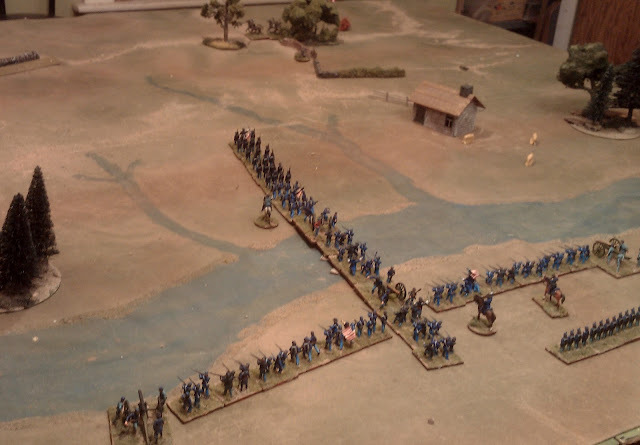 Despite casualties from sharpshooters as well as the battery, the blue clad veterans maneuvered steadily while their own guns returned fire just as grey clad infantry began to appear, Initially ahead of the 2nd Brigade and then to its left. General Williams grasped the situation in a flash and messengers galloped off. Moments later the blue line began to shift to the left as the First Brigade moved up to take over their positions and form a reserve. With a ringing cheer the long blue line swept forward, pausing only to unleash a tremendous volley. It was like a pair of boxcars rolling up the hill and the Grey clad infantry wavered and fell back. Following up on their success, the 2nd Brigade surged up the hill, three regiments attacking with two more in reserve. 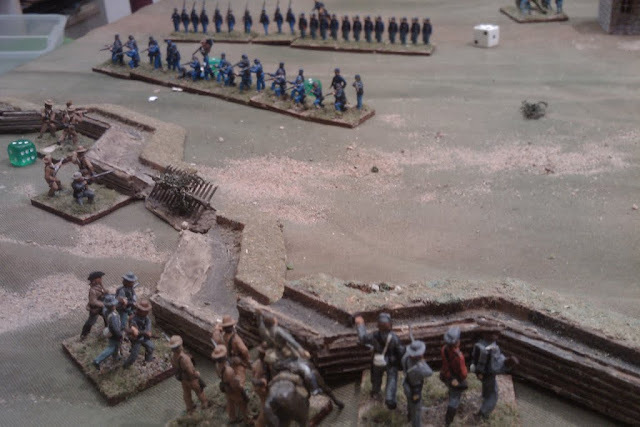 Smashing into a thin line of dismounted cavalry, the 2nd Illinois sent them running but the Second Carolina wheeled forward, enfilading the brigade's left. After a prolonged struggle the battered Blue regiments fell back. The Rebel line on the hill was looked thin and ragged by now and without a pause, the reserves pressed forward and opened a hot fire. The Rebs began to waver as the 1st Brigade came forward at a run, extending the line and opening fire. Eventually the battered rebels could take no more and retreated off the field. On the right, the concentrated fire of 4 Federal batteries silenced one Rebel battery after another. At last General Rosser seemed to wake up and the 1st Georgia and 1st Carolina began a hesitant counter attack on the Federal Second Brigade. As the musket fire rippled up and down the lines, the 11th Indiana Cavalry slipped almost unnoticed around the Rebel flank. At the last minute, General Rosser galloped across, ordered the reserve battery to be change front to the rear while he personally led the sharpshooters to help defend the guns. It was too little, too late. The bugles rang out, the swords went up and with a cheer, the Hosier cavalry charged up the hill, scattering the sharpshooters, cutting down Rosser and crashing through the battery into the rear of the 2nd Georgia. The shock collapsed the rebel line and sent the survivors fleeing into the woods. It seems that an aide helped General Rosser to evade the Federal cavalry and it is certain that this resilient officer shall fight again, but not today. 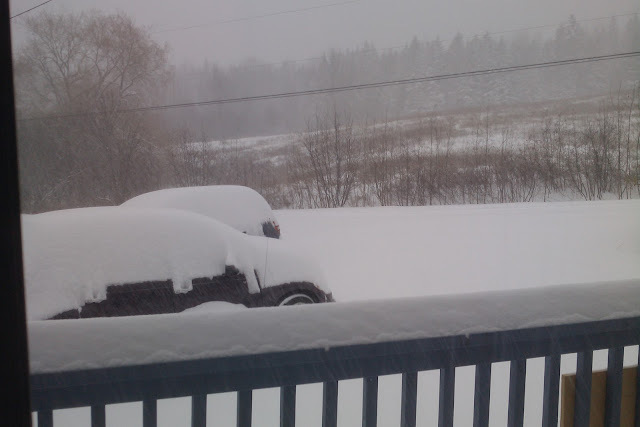 It took me most of the morning to clear the snow today so the game was a welcome diversion despite a few achy muscles. Once again the rules were Hearts of Tin. I meant to lean a bit towards the Rebs but today it went all the Yankee way. The Reb army started off ok but after a lapse in judgement which left a gap in the defence of the sunken road on the right hand hill was followed up by a shockingly effect Yankee volley ( 5 dice, 4x6's! ), the army seemed dazed, like a deer in the headlights. The first brigade and 3 guns sat quietly under a barrage by 4 batteries and watched a masking force of 2 regiments while the other 8 Yankee regiments assaulted the 2nd Brigade on the right hand hill. It wasn't until the cavalry and 2nd Brigade were shaken that it occurred to me to make use of the 1st. The Yankee 2nd Brigade had suffered heavily in their repulsed assault and there was some hope that a counter attack would shake them. But really, it was over. 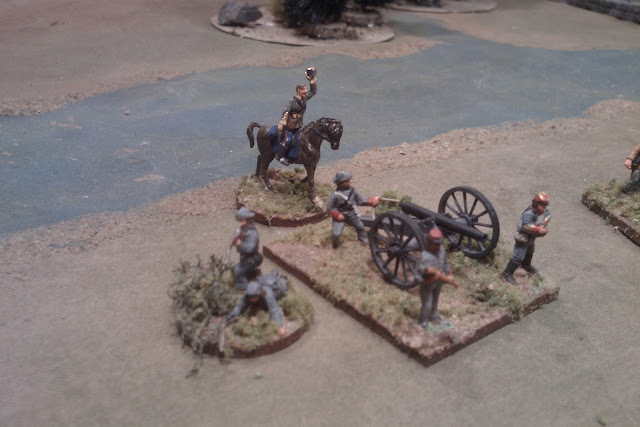 The Yankee artillery was just too well handled and maybe a little bit lucky while the Reb artillery was just the opposite. The 2nd brigade battery never even got off a shot. The spectacularly effective cavalry charge that ended the game was just the icing on the cake. Rules wise, the tweaks all worked but I realized afterwards when I double checked a few things, that I had been playing with some unwritten rules and some others where what was written didn't accurately reflect what I had meant, and a few others where I found myself playing an older version. I have added the minor bits that were missing or misleading and rather than trying to retrain myself, I have adjusted some bits (esp melee result) to reflect what I actually do. For anyone curious about the designations, I merely coupled the arbitrary, sequential ID number on the back of the stands with a State name, based on what the uniform made me thing of. No representation of any real regiment is intended. That's probably it for the ACW until I get some more Rebs painted up but who knows?. The view at noon. Bugler! Sound retreat! Back to the Games Room men! For once the forecast was spot on. Just the sort of day for some quality time with my toys. 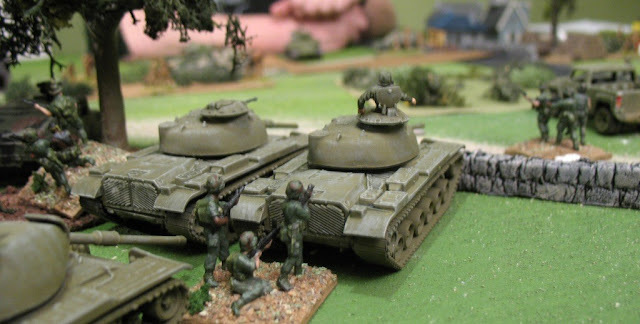 The temptation to run another game was almost overwhelming but the lack of Rebs in general and Reb artillery and Brigadiers in particular couldn't be ignored. A fairly thorough search turned up a few bits and bobs that could be pressed into service until some proper ordinance makes it though the blockade. this included, a metal Napoleonic gun that I commandeered from its Les Higgins RHA crew (poor lads they waited for 30m years to be painted and now their gun has been taken! ), some spare barrels and a WWI gun, surplus to requirements that, with a bit of trimming, provided a not quite right carriage. Annoyingly, all but 2 of my old Airfix gunners are still AWOL so I dug out various infantry and pioneers and started trimming off muskets and adding implements and lanyards. The new Reb batteries, with their improvised guns, defending a copy of Vol 1 of Battles and Leaders. I used to have a 1 volume condensed version but it is no match for the full thing. Getting the remaining volumes is on my list of ways to spend money. While I was waiting for an undercoat to dry, I turned my attention back to organization and scenarios. It didn't take long contemplating the F&F Great Western Battles scenarios and my table, and how many 100's more troops I would need to paint, as well as remembering how long, tedious and inconclusive the several that I had tried back in our 15mm F&F days had been, for me to remember that I didn't really want to go there, especially since this is supposed to be a minor sideshow. Next time I refight Shilo or Corinth or the like, it'll be either a V&B type game with 1 stand brigades or else a Grant style fudge. About double my current armies are about the most I want to think about painting and harbouring. Since the various options I had been considering all seem to have value, I decided the way the 3 stand regiments that they are currently organized into are as good as any. I'll just have to print off a whole stack of flags and convert a few more colour bearers. Several of the regiments are easily identifiable at the moment, for example there is only 1 on each side that is standing at attention with arms shouldered, but to make life easier when laying out and picking up, (not to mention removing a casualty from the middle of a brigade line), I assigned the regiments to brigades and proceeded to paint a Roman numeral on the back of each stand as a regimental identifier. Red for the first brigade, white for the 2nd. the rest will follow. Selection of State and number will also follow and be marked underneath. 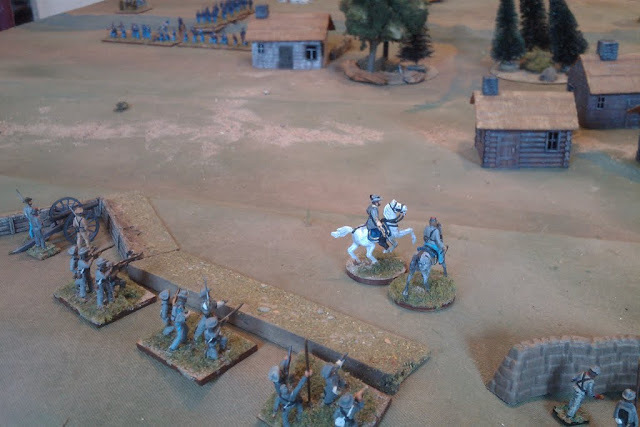 Brigadier Steele, originally a conversion forming part of a unit of volunteer Scouts for a Riel Rebellion game that never materialized, with a new hat to replace the one he lost, a new base for his horse, and a lick of new paint here and there, cheers on the Horse Artillery while a sharpshooter pulls a bead on the camera man. After a delightful afternoon of converting, fixing, painting and basing, I was ready to lay out a game. The artillery was evened up but the Yankee infantry still outnumbered the Rebs 5:3. I decided on an attack against a hasty defence. I'd had enough of Sawmill Village for now, so I cleared it off, and rearranged things a bit. Sometime late in 1861, the Yanks, under General Williams,with 10 regiments, 4 guns and a regiment of cavalry have thrown yet another pontoon bridge over the Paynted River. The Confederates under General Rosser have been alerted and are rushing to the spot with 6 regiments of infantry, a company of sharpshooters, 4 guns and a small regiment of cavalry. The cavalry, horse artillery and sharpshooters arrive on table on Turn 1. The 1st Brigade on turn 2 and the 3rd Brigade on turn 3. the Federals start with the bridge in place and their columns ready to cross. Their aim is to control the ridge overlooking the bridge. Why don't things ever go smooth? Just when the river crossing seemed to be going according to plan, Reb cavalry appears on the ridge. After 15 hours, the snow seems to be slowly ending as the temperatures warm up but I don't think I'm going very far tomorrow so the Battle of Snoughbound Ridge will resume. The weather forecast is calling for 15-25 cm of unseasonable snow on Wednesday so I postponed my trip and spent the day getting the yard ready and stacking more firewood into the shed. Well, not ALL the day, I didn't have time for a game but I broke out Vol 1 of Battles and Leaders and looked at a couple of Orders of Battle, contemplated elastic ground scales and scenarios then did some experimental maneuvering of various regiment and brigade sizes and configurations. Apart from Gettysburg, I'm more interested in the early years of the war, 1861 & 62 when many of the armies were smaller and it was all new. It seems that if gaming 1861 at least, a 500 man regiment is not unreasonable in either army. Depending on where you peg the ground scale, each of my stands can reasonably be anywhere from 120 to 200 men so 3 stands is reasonable but 2 or 4 would also work. A total of 15,000 troops or 30 "standard" regiments would cover a number of battles but they need anywhere up to about 10 miles of frontage as opposed to the 1 or 2 miles that I can squeeze onto my table unless I measure in centimeters in which case each stand becomes a regiment and the whole thing will look out of scale anyway. So, no firm conclusion yet but I'm leaning towards 4 stand regiments as units without dismissing the 3 stand ones yet. For teasers, I'll field 2 regiments per scenario "unit'" (once I have enough troops) and for historical battles, I'll calculate how many stands per brigade and use that to decide how many regiments to field rather than adjusting the regiments even though that will lead to some units being the "3rd & 5th Texas" or what have you. I also took some time tonight to play out some Brigade firefights and some charges. it didn't take long to notice the ripple effect of taking of stands as originally intended. Losses went from severe to unsupportable. The double dice in melee was a relatively recent introduction so I went back closer to Morschauser's original values. So, for infantry with rifles for example, instead of 1 die over 4,5,6 when shooting and 2 dice for 4,5,6 in "melee" (up to 3" apart so we aren't talking fisticuffs). it is back to 1 die per stand 4,5,6 to hit in melee and 5,6 to hit when shooting, 6 if using muskets. Those are the values I originally used for Morschauser meets MacDuff and after a number of 1 on 1 brigade scuffles, they seem to still work. i also went to check the details on the Hold Fire rule and couldn't find it so that has been added. A necessary rule if fire and movement is allowed so, another ripple. Having noticed that I need more guns, I also spent time looking at the Musket Miniatures 23mm ACW range again. Pity they don't take Paypal. If you have coin for a bulk deal, the artillery actually works out cheaper for actual model guns than buying boxes of plastic. At least if you leave off limbers but even these are reasonable. They also have command figures. If at first you don't succeed, or "Git around behint 'em". 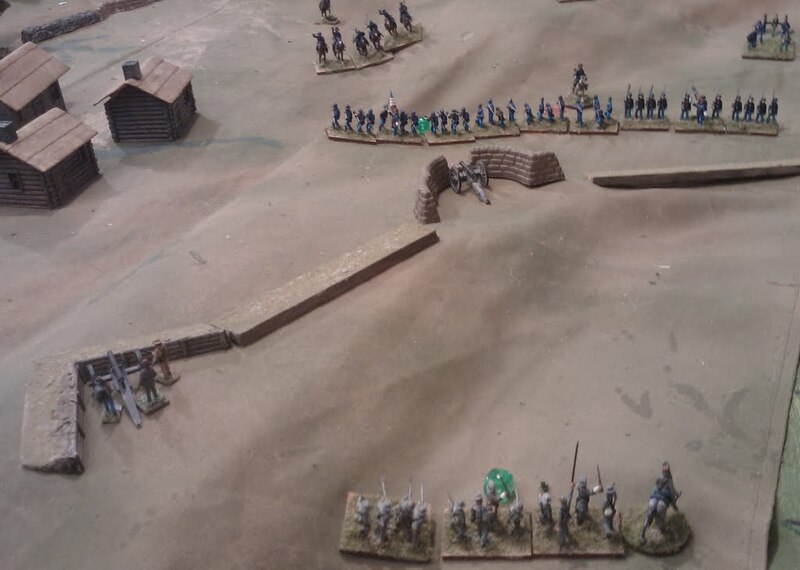 Well there I was, I wanted to try an 1840 MacDuff game on my flat hills but I also wanted to play a bigger ACW game despite not having any more Rebs painted up. A completely different scenario would mean clearing the table but what if the Yanks who had just been seen off, came back with friends? What if they threw a pontoon bridge BEHIND the Rebels? As quick as thought the Rebs fell back towards their entry point and dug in along the hills with the right flank refused. The Butternut Brigade on the left, Virginians on the right. Each of 3 regiments and a battery deployed with 1 regiment in reserve. Two stray stands of cavalry formed an army reserve. All under General Rosser. General Rosser (on Ol' Whitey) and Brigadier Porter watch the Federal army deploy. The Yanks, having also refilled their ranks, sent the 1st and 2nd Brigades back up the way they had come, each with 3 regiments and a battery, the plan being to advance in column of Brigade and attack the Rebel right. The newly arrived 3rd brigade with 4 regiments and a battery crossed over the new pontoon bridge facing the Rebel left with orders to "amuse" them and then, once the main assault went in, to attack the enemy left. Colonel French filling in as Brigadier for 3rd Brigade. The lads in front were painted back c 1982, the ones on the bridge are part of the new additions from that same lot. Things went more or less as planned for Billy Yank. After a bit of softening up with artillery and rifle fire, the 1st Brigade charged in led by Brigadier Dryver. OK so maybe the charge didn't quite go as planned. However, Reb losses were heavy and they didn't have many men to spare. The shocking aftermath of the first charge on the entrenchments. The Rebs threw 10 dice for 4,5 or 6 and scored 10 hits! Then the Brigadier went down! The remnants of the 1st Brigade may be seen on the hill behind the 2nd Brigade. On the Yankee right, the 3rd Brigade was a bit more cautious, and traded fire with the Rebs for a few more turns, opening up some gaps. When they finally charged in, they seized the front line, only to be thrown back by a counter attack. The 3rd Brigade prepares to charge. Bringing their 2nd line forward, the 3rd Brigade charged in again and were bloodily repulsed, routing back towards the bridge. Hurriedly, the remnants of the Butternut brigade rushed to support the Virginians who had fallen back to rally while the cavalry held the line. Every one expected the cavalry to hold for a while but they were barely in place when a storm of shot, shell and rifle fire blew them away. The 2nd Brigade surged forward over the lines and in a fierce firefight broke the Virginians just as the Butternuts hurried up. The issue hung in the balance. Could the battered Butternut counter attack throw back the last Yankee Brigade? 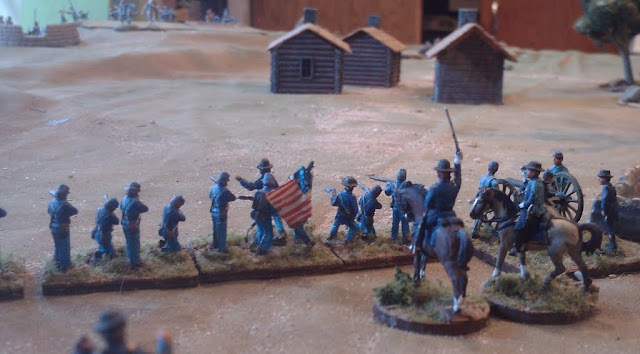 A brief pause as the Rebs desperately struggle to form a line. The very hasty nature of the entrenchments is clearly shown here. A redoubt and sunken road from my old 15mm ACW setup and a toy sandbag emplacement. Nope. 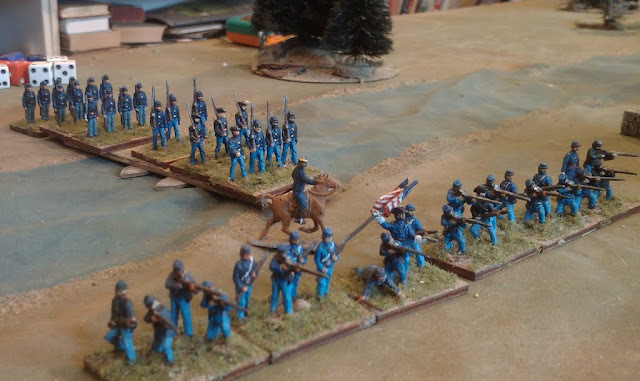 The dismounted cavalry stormed up the hill and took the battery and while the Union line appeared to be wavering, they seized the initiative and kept up a hot fire, mowing down the Butternuts and driving them from the field. So there we have it. 18 stands of Reb infantry with 2 stands of cavalry and 2 guns defending against 30 stands of Yanks with 3 cavalry and 4 guns and it came down to the wire. 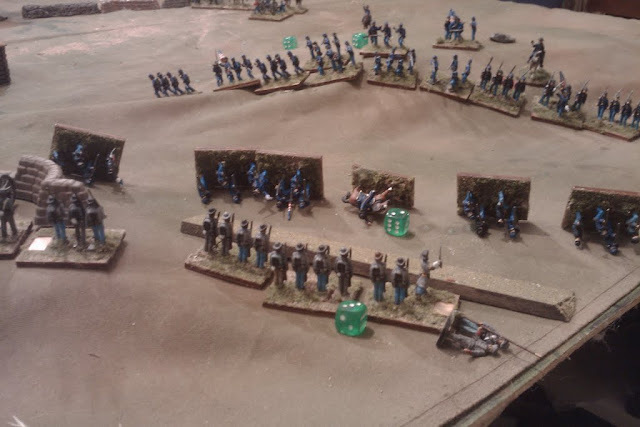 If the Yanks hadn't won a shift in initiative and then fired their most devastating volley of the day, the game might well have tipped in the Reb favour. A Pyrrhic Victory either way. I've no idea how many turns I played,probably between 12 and 16 but the game took a little under an hour. For a pitched battle, I should be able to squeeze 3 times the number of stands on and get a solid day's battle from it. I should also be able to do some smaller historical battles or sections of larger ones, I need to reconsider my organization though which is standard 3 stand regiments as Units with 3 to 6 regiments forming brigades as Commands. At this rate the game just fought was 2 divisions facing off and allowing up to a corps aside if I paint enough to crowd the table. Some calculation on ground scale tells me that my stands have the right frontage for about 200 men so 3 stands is a very strong regiment and anyway, I don't really want 1 man in 12 to carry a flag or have to figure out to tell 30 regiments apart.I'm even more dismayed at having an anonymous collection of stands that get parceled out into temporary regiments. I may be better off organizing to use Brigades as Units with these grouped into Divisions and the whole forming a Corps. 200 men per stand is the same as the alternate Fire & Fury scale with typical brigades being 6 to 8 stands, occasionally larger. 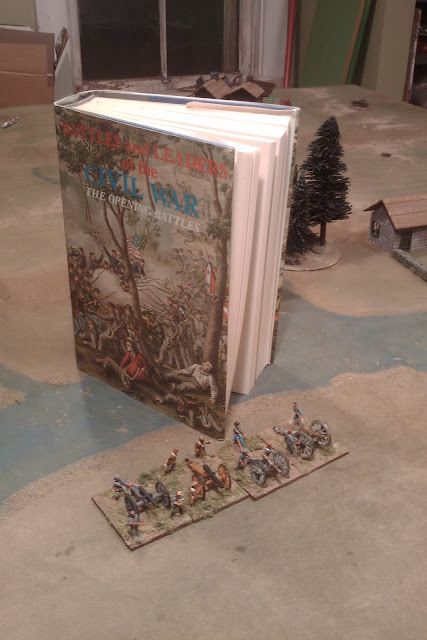 This would mean that I could use F&F set ups from the Great Western Battles book, the Gettysburg scenarios from the rule book and Bull Run from the Courier. Or, well, I could if I still had a 6'x8' table... Parts of battles then! or maybe I should think about that temporary 5'x7' extension for my table. Rules wise, I was pretty happy. Apart from some editing errors, there were 2 small tweaks, 1 to the wording for Shaken Commands, the other to the options for how hits get translated to stand removal. The idea was that since "hits" are as much or more about loss of cohesion as actual casualties then it would make sense to mark one hit on every stand and then start taking them off. The unit would still be able to take the same number of hits. That was the theory. Apart from the hassle of marking more hits, the idea had also been that brigades would gradually get weaker as they lost stands but with distributing hits, the brigade could sometimes take 50% hits without losing any combat power. Then it would disintegrate rapidly as each additional hit removed a stand. It also meant that defensive fire against a charge was less effective since they often wouldn't reduce the attacker's combat power. So I have gone back to the original idea that a stand comes off for every 2 hits. One could always substitute casualty stands as space holders, could. I'm off to Fredericton for a few days to visit family. This means several days away from gaming and about 10 hours of highway time to ponder gaming, so who knows what I'll do next. More ACW? An 1840's MacDuff game or maybe back to Ancients?